In order to begin discussions about your research, you would need to provide us with an indication of what particular species interests you? Do you have GIS skills? And how much time (number of weeks) would you have available to be in the field with us? From there, we can start to formulate a general idea for a project, and then start to discuss research specifics, once your booking and placement are confirmed. Dr Heleen Druce, our Wildlife ACT Research Coordinator, acts as supervisor for all our student participants – she will be able to provide the relevant guidance you need from a research point of view, including possible project focus options. Mrs Bronwen Kelly, our Wildlife ACT Reservations Manager, will gladly assist you with the booking process and the logistics of creating your actual placement. Please note that this video was produced in 2009. Please get in touch for updated info. Currently our students and researchers operate within various game reserves in Northern KwaZulu-Natal: including Tembe Elephant Park, Somkhanda Game Reserve, uMkhuze Game Reserve, Manyoni Private Game Reserve and the Hluhluwe-iMfolozi Park. Students who join us are expected to participate in all the same duties / activities as the other volunteers who will be joining them on the placement, since together they form the active monitoring team for that location. Students will however receive access to data for analysis and write up, for their own academic needs. Our internships are designed to offer participants insight into working in the field of conservation and are not research-oriented. This is an opportunity to gain work experience with no data or projects being completed. What will be required is an unassisted, 2-page report on any conservation topic that interests you. We provide participants with a certificate of participation and an evaluation report which can be submitted to your institution and added to your curriculum vitae or resumé. Undergraduate Students will be given a choice between two different pre-defined datasets that they can analyse, and a list of outcomes that they need to address in their report. One will be GIS based while the other will be more behavioural; depending on the affinity of the student. Please note that the relevant data will only be issued once you are here with us. Postgraduate students who are registered at an academic institution, and who come with their own supervisors , will have a choice from a LIST OF research priorities for the year. There will be a limited number of Postgraduate research projects accepted, for each year. We will work closely with the Postgraduate research student to design a project that meets their needs, as well as answering a critical question for the reserve. We will guide the student, but we will need them to design the project and write up a suitable proposal for approval. Registered students who join us for research projects will be required to sign an agreement covering data ownership, confidentiality and reporting parameters. Researchers should note that they are unlikely to collect all of the data that they require for their projects during their short stay as a volunteer, so the fieldwork component is a “snapshot” of the methodology that allows for a small component of their data collection, with historical data forming the basis of their study. It is also important to note that postgraduate research project proposals and drafts will need to be approved by both the Wildlife ACT Research Coordinator and the reserve Management teams – which can take some time because of their other commitments, so this must be planned for in your timeline. An average day for students as part of the volunteer team would consist of two field monitoring sessions per day, with administrative and camp-based work completed around these field hours. We do also allocate one “admin afternoon” per week, and on that day only one monitoring session will take place. Monitoring is vehicle-based, and our participants operate the radio-telemetry equipment and GPS, record the data and make notes, and take photographs and videos for compiling and updating ID kits. Back at camp, our participants assist with data capture and data cleaning, working on ID kits, compiling social media updates, camp and vehicle maintenance tasks, preparing their own meals, and other “research assistant”-type tasks, before turning in for the night to begin again early the following morning. The data that is collected by our monitoring teams on a daily basis includes location data, feeding observations, condition assessments, and behavioural observations – depending very much on the species being monitored/observed. Critical information such as wounds, snares or the birth of new individuals is reported immediately to the Reserve’s Management staff. The other data is captured into our databases and transferred to the Reserve’s Management in the form of both raw data and a detailed Monthly Report. There are also Quarterly Reports produced every three months. Our volunteers are very active in cleaning, capturing and processing data. The Protected Areas use the data that we collect to report to Species-specific Regional and National forums. 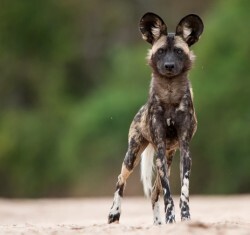 In addition, it is a critical tool for Protected Area Management decision-making: for example, feeding data from predator observations will influence whether the Protected Area introduces prey species or removes prey species to sell; information about breeding rates of a pack of wild dogs will help determine how many wild dogs are available in the regional metapopulation to capture and re-populate new areas and thus help grow the population of this endangered species; data about the interactions of predator species will help to determine protected area stocking rates; etc. As a student participant, your monitor will happily involve you in the data collection and reporting processes; however please note that we are unable to distribute or share this data outside of our projects without a signed Research Agreement. There are a number of outputs from the data we collect. Some of these require the use of Global Information System (GIS) software which analyses the information spatially. You may be able to complete a GIS course at your university before coming to Africa. GIS is used widely by conservationists and animal behaviour scientists throughout the world and is a valuable skill to add to your CV. GIS software is very powerful and will be able to supply you with many different angles of analysis. We list only a few examples here, but realistically the applications are vast. Ultimately if you would like to use GIS you will be able to develop a project specifically moulded around the software’s capabilities. This will allow you to ascertain the area an animal requires, whether males range further than females, whether individuals or different species share the same space or if animals have different ranging behaviours from one season to the next. The software can calculate the sizes of these home ranges and the overlap between individuals. Using a habitat map and an animal’s home range you can ‘cut out’ the area the animal uses and assess which habitats it uses and if this changes seasonally. GIS software can also calculate the size of these areas enabling you to assess which habitats are more preferred than others. Using GIS, students can calculate the distance each animal’s location is from the closest source of a number of different features. For example, the distance to the nearest fence, road, water point or building. This will allow you to analyse whether any of those features have any effect on their movement across the landscape. Examples: Rhino home ranges and applications for anti-poaching activities; wild dog home range sizes relative to number of packs to assess impacts; effect of lion densities on wild dog movements to inform predator management. For example you could calculate whether animal behaviours change during different times of the day and whether these changes occur seasonally. This can be done with a formula in a spreadsheet using the longitude and latitude information. You can assess the straight line distance an animal moves from one day to the next or the straight line distance between two animals on the same day. Example 1: You can test whether elephants travel further during the dry season while searching for food. Example 2: You can test whether African Wild Dogs keep at a minimum distance from the lion pride. Using a similar formula you could calculate the distance an animal is from certain points of interest. Example: You can calculate the change in distance an individual is from permanent water sources since the first seasonal rains. You might expect the distance to decrease as water becomes more readily available across the landscape. You can understand how a predator’s selection of prey species changes over different seasons in conjunction with the abundances of available prey (you can access the game counts which are done on an annual basis). Example: You could test whether there is an increase in impala and wildebeest prey numbers during the spring calving season when juveniles are easy prey. While our routine data collection for reserve Managers takes precedence, we may be able to customize data collection to include other parameters, to suit your project’s needs. Please discuss this with us during the project proposal phase, to assess the feasibility.